It was way back in 1990 when 5 sisters named Toni, Tamar, Trina, Towanda and Traci Braxton released their first, and last, single The Good Life as a group. The writers decided to capitalise on the group being sisters and introduce them to the world by making their first single an account of a typical day in the Braxton family home. Though the subject matter was commendable the way it was handled was not. Cheesy, Brady Bunchesque lyrics, like "Dinners ready, time to share," "Grandma in a rocking chair, proud to have her little Grandson there" were cringe-worthy and the overbearing sunny, sugary production insured the single failed to connect with the dysfunctional general public. The group were dropped from Arista Records after The Good Life flopped. While the Braxton ship was sinking L.A Reid and Babyface, who were sailing the seas looking for new acts to sign to their up-and-coming Laface record label, took a shine to Toni and threw her a lifebuoy. After reeling Toni in and signing her as their first artist, Reid and Babyface sped off and left the rest of the Braxton family to drown into obscurity. The original Braxtons line up was no more but three of the sisters, Trina, Tamar and Townada, washed up on the shores of the music scene in 1996 with an album of quality R nb and smooth groove songs entitled So Many Ways. The three Braxton sisters all shared rich, thick, smoky voices, like their now famous sister Toni, but each had distinct enough voices to make them harmonise well as a group but at the same time still be individually distinguishable. Although So Many ways debuting at number 133 on the Billboard album charts effectively sealed their fate the album still left its mark on the music industry with some timeless RnB/pop songs. Slow flow was a mid-tempo RnB jam that showed each of the singers individual voices as well as their ability to harmonise effectively. 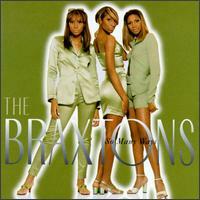 The Braxtons' do disco on The boss. A sure fire cure for the blues.